Steve, attached to this is a couple of images of my current project bike. It is a 1971 250 Silver Shotgun (as they are known here in the land of Oz). 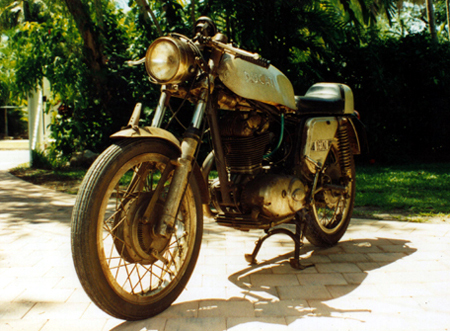 The bike has been sitting inhibited since 1972 with only 3800 miles on the clock. The original owner fell off the bike damaging only the Silentium muffler (hence the aftermarket Conti look-alike) and putting a small cut in the throttle twist grip. He then figured that this motorcycling caper was not for him and parked the bike. A year later a massive tropical cyclone (Hurricane in your hemisphere?) destroyed Darwin where I live and the bike was passed on to a local Ducati agent who wisely inhibited it and packed it away behind all the glamorous twins. So...there it was in the mid 90's looking unloved and unappreciated. I spoke to the retired dealer about purchasing it but he was extremely stubborn and refused to sell it. You know how it goes, the more you look at a Ducati, the more in love with it you fall. Eventually after making a complete nuisance out of myself and convincing him that I could not live without it he decided to sell it to me. 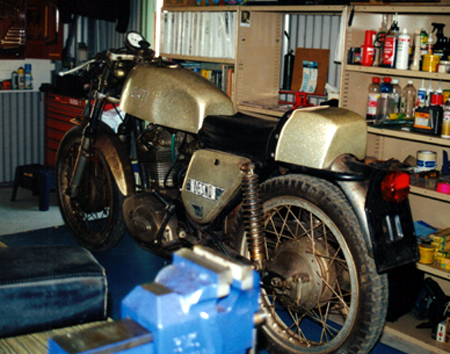 I also showed him a few of my other restorations and he agreed that I was the right idiot for the job. So...I don't know how popular singles are in your country but here they appear to run a poor second to the big twins. The thing is though, these little babbies are fitted out with really trick gear and go like stink. After riding one years ago, I could not wipe the grin off my face for hours. We are talking fun-factor 10 here, they are the best kept secret of the Ducati world. It is easy to see why Taglioni had such a soft spot for the singles, they are fantastic. 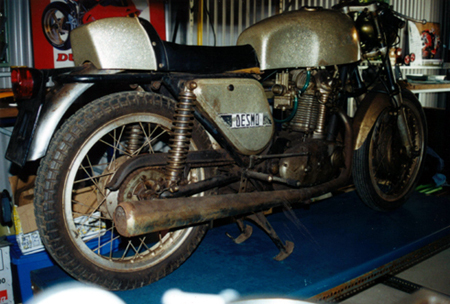 I am currently starting the restoration of this little beauty and cant wait to sling a leg over it. The bike is just like a miniature SS with rear-sets, fiberglass tank, front mudguard and side panels. The rear guard was stainless steel and the forks where a whopping 35mm, very large for a small bike. The front brake is a huge duel sided single leading shoe Grimeca unit which has superior stopping power and fell to it than the contemporary disc models. The fork clamps are beautifully cast with clip-ons completing the cafe racer look. The wheels are Borrani of course and the whole package is just gorgeous. Oh..yeah, it is a desmo too as nothing exceeds like excess! I think this may have been Ducati's last real single as they then tamed them a bit for general consumption with steel tanks etc, etc. Sorry to bore you with this stuff but thats the price you pay.